In April, 1965 the Wagoneer became the first Jeep vehicle to be offered with a V-8 engine when the American Motors' 327 cubic inch V-8 became available as an option. 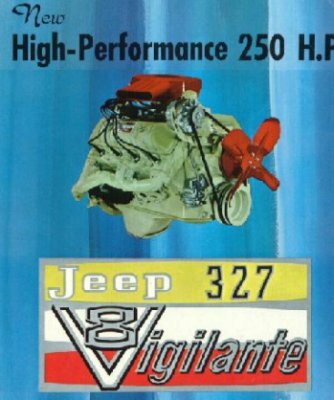 The overhead cam six was still the standard engine, but this "Vigilante" V-8 was, at $190.83, an attractive alternative. With a 2-barrel carburetor the V-8 developed 250 horsepower at 4700 rpm and 340 lb.ft. of torque at 2600 rpm. This engine was originally introduced in 1956 for the Nash Ambassador Special line. At that time it displaced 250 cubic inches with a bore and stroke of 3.50 x 3.25 inches. Peak horsepower was 190 at 4900 rpm with a 8.0:1 compression ratio and a single 2-barrel Carter carburetor. Most engine analysts regarded it as a straighforward design that, if lacking in exciting features, was reliable and up-to-date. Four main bearings were used and with all accessories, but minus its flywheel and clutch this V-8 weighed 601 pounds. Thinwall construction was used for all iron castings and with good-sized valves (1.79 inch intake and 1.41 exhaust) plus a 4.75 inch bore center-to-bore center measurement it was easily expanded to 327 cubic inches with a 4 inch bore and 3.25 inch stroke in 1957. At that point its maximum horsepower was 255 at 4700 rpm with a 4-barrel Carter carburetor and 9.0:1 compression ratio. 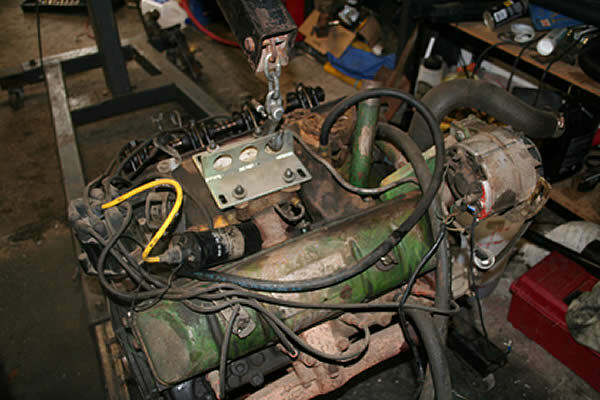 In December, 1956 American Motors announced that this engine would power its entry in the then popular limited production high-performance field, the Rambler Rebel. The 255 horsepower version would be standard. The V-8 was available with and optional Bendix electronic fuel injection system. Due to production problems no Rebels were sold with the fuel injection but the next year a more powerful V-8 with 270 horsepower at 4700 rpm and a higher 9.7:1 compression ration was offered.